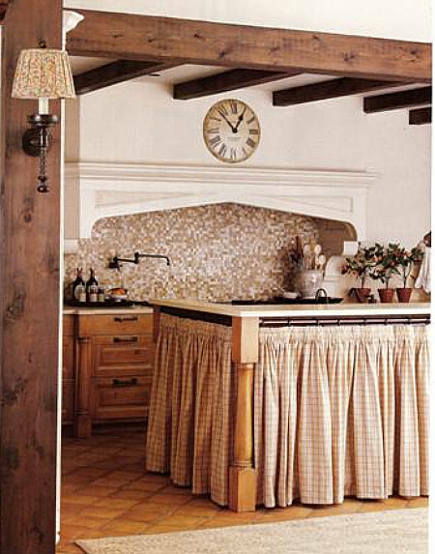 “What’s old is new again.” Look no further than kitchen cabinets with fabric skirts. Prior to the post-World War II home-building boom in the U.S., middle class kitchens commonly had cabinets with fabric skirts, often homemade, to screen off the open areas below sinks and base cabinet frames. Although skirts went out as a style in the 1950s, fabric lingered in country houses everywhere and, of course, can still be spotted in classic movies. Now, it’s creeping back with some surprisingly elaborate variations. 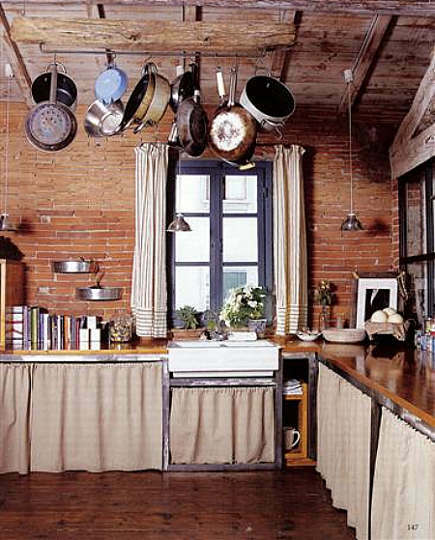 A kitchen [top] in an old Tuscan wool mill has traditional Italian country tea-stained linen cabinet skirts with rod pockets. While they don’t slide easily, they look authentic – just the statement for an avant-garde furniture designer with an Über hip website (hmg.it). Cranking up the fancy quotient, Nashville designer Laura Robinson hung gathered and smocked fabric on rings — like real curtains — for easy-sliding. These “full skirt” covers go all around an elaborate island and conceal a big TV on the opposite side of the great- room kitchen that has our favorite green dish display cabinet. This spring, straight skirts done in Schumacher indigo tent-stripes were used for a show house kitchen at Greystone, a legendary estate in Beverly Hills that belonged to the Doheny family. Magazine editors came up with the look. 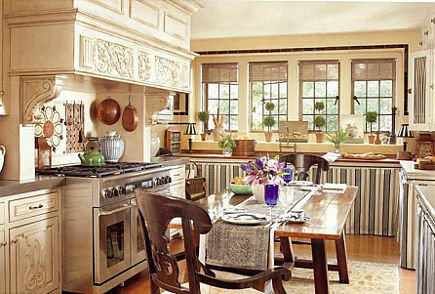 About ten years ago, we rented a house in Tuscany which had a skirted-cabinet kitchen. Let me be diplomatic and confess that I found it annoying to move fabric out of the way while my hands were covered with pie dough. Still, I won’t let my critic’s gene go negative here. When time comes to recycle these cabinets, think of Scarlett O’Hara for inspiration.